Cold stress starts when temperatures drop below 60 degrees Fahrenheit in dairy calves who are less than 21 days-of-age and when below 42 degrees (Litherland, 2013) in calves greater than 42 days of age. Winter can present challenges for dairy producers and heifer growers as they try to keep calves alive and growing adequately in frigid temperatures. 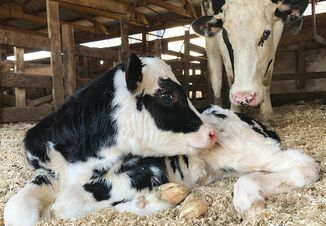 in the first 48 hours of life - following proper protocols for newborn calves, especially drying them off as quickly as possible after birth and making sure they are consuming 4 quarts of high quality colostrum within the first 12 hours of life, as well as giving proper vaccinations, and dipping their navels. to quickly dry newborn calves and help increase body temperature. Provide a proper nest; when they are laying down a guide is that one should not be able to see the feet & legs of the calf. Even though they add extra expense, they are reusable and provide an extra layer of protection for calves. Make sure to adequately clean and dry blankets between uses. is important but you must also prevent direct drafts from hitting young calves. Fresh air helps reduce the presence airborne pathogens and ammonia that is produced by urine & manure. 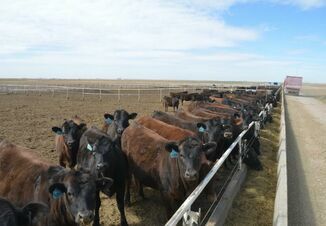 Increasing feedings per day which will provide 1.5 pounds to 2.25 pounds of milk replacer powder per day with 20% fat are necessary to provide adequate energy intake daily. Other options of increasing caloric intake. Provide warm water above 102 degrees F about 30 minutes after feeding. Water is essential to start and keep the digestive track of the calf working properly, along with promoting dry matter intake. Again, remember, be careful not to get it too hot though and scald the calves' mouth. (free of mold and fines), to encourage daily intake. Reference: Litherland, N. (2013). Feeding and Management tips to combat cold stress in nursery calves. University of Minnesota.